This page is no longer updated daily as we have stopped TMI data processing as of April 6th 2015. In August 2014, NASA reported that the fuel tank on TRMM was nearly empty. The fuel is used for keeping the satellite in a stable orbit at a fixed altitude. TRMM is unique in having a much lower altitude (about 400 km) compared with most other low Earth orbiting satellites (about 800 km). While the atmosphere is very thin at 400 km, there are still oxygen molecules that produce drag on the satellite. Without a periodic boost, the atmospheric drag causes the satellite to drift back towards Earth. Fuel is also required to avoid space debris. The lifetime of TRMM has far exceeded the original goals, so far providing 17 years of high quality data to the scientific community. This long time series of data has contributed greatly to advancing scientific understanding of tropical dynamics, cloud microphysics, and atmosphere-ocean interaction. After the launch of TRMM in 1997, it was initially placed in orbit at an altitude of 350 km. In 2001 an orbital boost maneuver raised the orbit to 402 km in order to extend the mission life of the satellite. This altitude change had an effect on Precipitation Radar (PR) reflectivity [Short and Nakamura, 2010] and on TRMM Microwave Imager (TMI) rain rates [DeMoss and Bowman, 2007]. The Remote Sensing Systems (RSS) rain algorithm accounts for footprint size (a function of altitude) in estimating sub-pixel variability, which mitigates the effect of TRMM altitiude changes on TMI rain rates [Hilburn and Wentz, 2008]. RSS processing of TMI data accounts for spacecraft location, velocity, and attitude; thus, we produced data throughout the orbital decline period. RSS stopped processing TMI data on April 6th, 2015. We will reprocess the 2015 data to Version-7 to complete our TMI data set. NASA stopped instrument operation on April 8th 2015. The TRMM instrument fell into the atmosphere on June 16th, 2015. We monitored the decline of the TRMM orbit in order to better determine the effects of altitude change on the TMI data products we provide to Users. The plot below was updated daily during the decline and shows the original altitude, the raised satellite altitude and the altitude changes between August 2014 and April 2015. The following figures show the differences of V7.2 AMSR2 and V4 TMI data products over time. The difference should be close to zero for these carefully collocated data. We use a collocation window of only 30 minutes and 25 km. The wind speed and water vapor differences increased significantly in the months since October 2014 and we assume these changes to be due to the TRMM orbit decline. 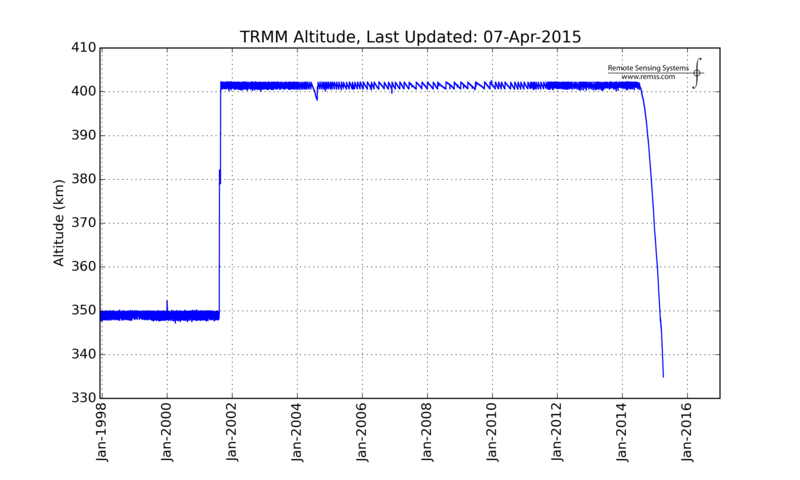 The vertical line at August 2014 shows the time at which the TRMM satellite fell below an altitude of 400 km. 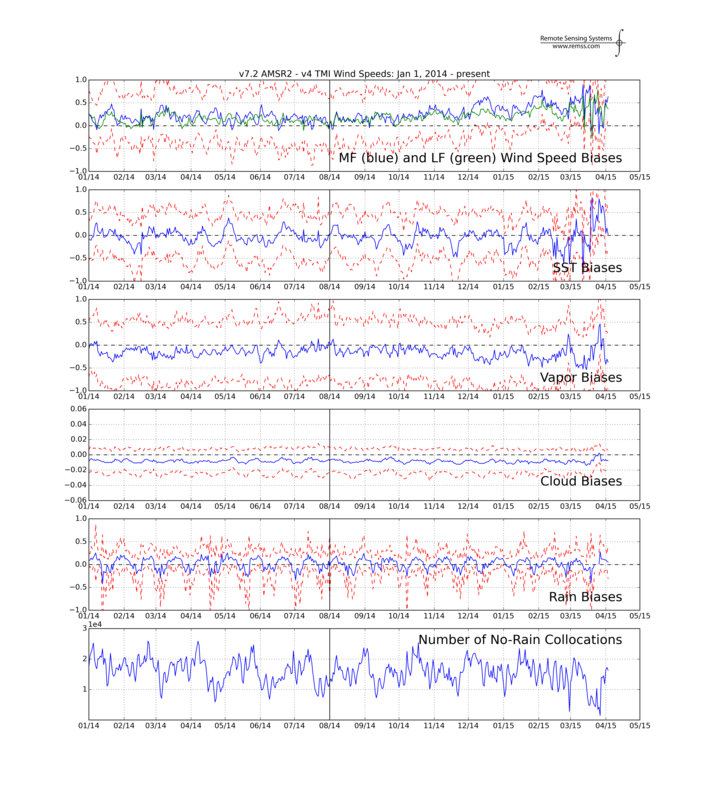 The wind speed plot at the top shows both the medium-frequency wind speed differences (blue: MF wind) and the low-frequency wind speed differences (green: LF Wind). The red dashed lines are the +/- 1 standard deviation for each product. In the wind plot, only the standard deviation for the MF wind is shown. The steady bias of about -0.05 in cloud liquid water differences is due to comparing the V7.2 AMSR2 with the V4 TMI data. If we compare TMI data processed using the RSS Version-7 Algorithm, no bias is present. For any climate research, we advise not using TMI data after October 1, 2014. DeMoss, J. D., and K. P. Bowman, 2007: Changes in TRMM rainfall due to the orbit boost estimated from buoy rain gauge data. Journal of Atmospheric and Oceanic Technology, 24, 1598-1607. Hilburn, K. A., and F. J. Wentz, 2008: Intercalibrated passive microwave rain products from the unified microwave ocean retrieval algorithm (UMORA). Journal of Applied Meteorology and Climatology, 47, 778-779. Satnews Daily, article posted August 26th, 2014, "NASA—The Decline Of TRMM (Satellite)", http://www.satnews.com/story.php?number=1351885953, accessed October 20, 2014. Short, D. A., and K. Nakamura, 2010: Effect of TRMM orbit boost on radar reflectivity distributions. Journal of Atmospheric and Oceanic Technology, 27, 1247-1254. Remote Sensing Systems is a world leader in processing and analyzing microwave data collected by satellite microwave sensors. Our mission is to provide research-quality geophysical data to the global scientific community.